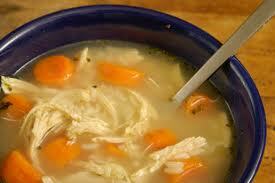 Chicken soup is a staple food for Jewish people. It is ‘Jewish penicillin’, the equivalent of soul food; a traditional starter for Friday night dinner; a great way to soak up a bagel. Over the years, I have acquired an almost-compulsory appreciation for chopped liver, smoked salmon and kiddush wine. But this is one aspect of my culture that I just can’t warm to it. Maybe it’s the way that the broth, having hosted a roast chicken for the last five hours, is a sea of fat globules and stray chicken morsels. If this was steak, these are the bits we would cut off, but somehow in chicken soup they get pride of place. Then there’s the noodles, conventionally thin vermicelli, which float around elusively, and prove fairly flavourless once you track down the buggers. Then there’s the massive dumpling in the middle, promising nothing but an odd mouthful of dough which might as well be cotton wool. For now I’d rather stick to the feel good factor of substantial vegetable soups like butternut squash, pea or tomato, which are healthier, less time-consuming to make and generally just much more full of taste.